While visiting a UK chat room to learn more about MS, he met Michelle, an Australian who had also been diagnosed. They struck up a friendship and in 2000 Andrew moved to Sydney where he and Michelle married. After a few years travelling around Australia for work, Andrew retired to his wife’s home town where he enjoys reading, cooking and writing a history of Scotland. Having teenagers in the house means lots of driving for Andrew. Whether it be for school, sleep overs or Levi’s Tae Kwon Do, there is always lots of activity. 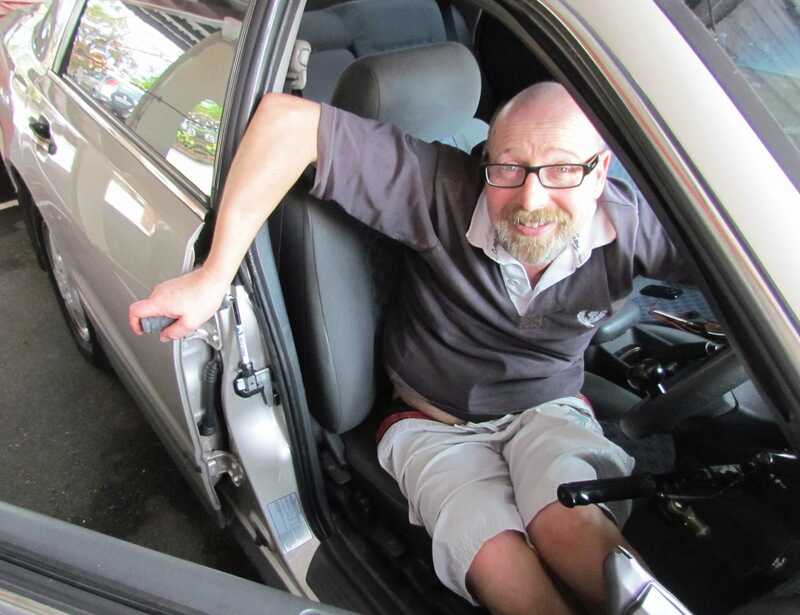 Andrew uses a manual wheelchair for all mobility and drives a car with hand controls. Andrew can independently stand and pivot to transfer from the car to his wheelchair, provided he has something to hold onto. 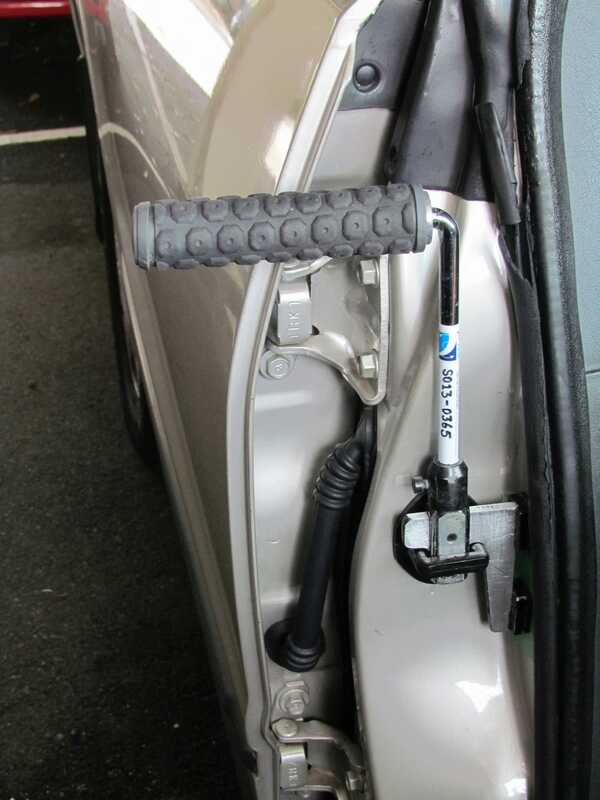 When transferring from his car to his wheelchair he had nothing adequate to support his weight and was using the sloping surface of the rear door while transferring from the driver’s seat to his wheelchair. This was not stable and could have led to a fall. Commercial handles provided support, however at a level which was too low for Andrew’s needs. Andrew’s Occupational Therapist, Amanda, contacted the local TAD Port Macquarie Group volunteers to find a solution. To conform to the Roads and Maritime Services requirements, a support device could use existing structures, but not be affixed to the vehicle in any way. So volunteer John Brumby met with Andrew and Amanda to review the problem. John suggested a handle which fitted into the door striker plate of Andrew’s Mitsubishi Magna. A wooden prototype was constructed to test the right fit and provide Andrew with a suitable point to lift himself. A very snug fit was essential to achieve a firm and stable mounting, thereby providing security during Andrew’s transfer. 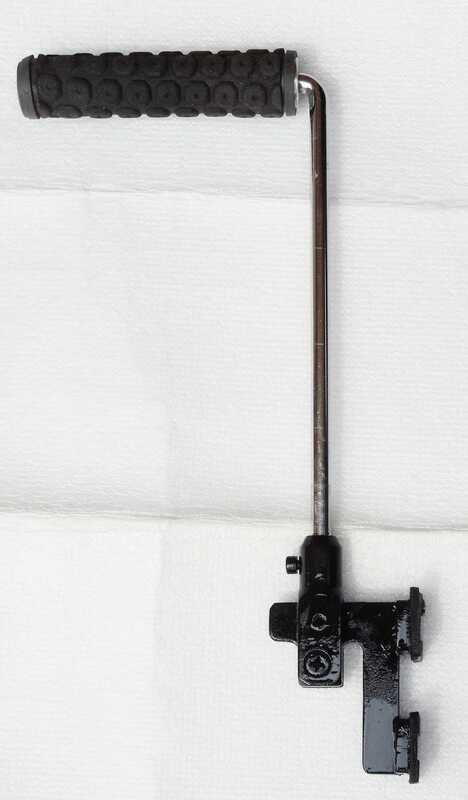 This was achieved by creating a tongue on the base of the handle which inserted through the loop of the striker plate, while the handle base had to rest evenly on the top. 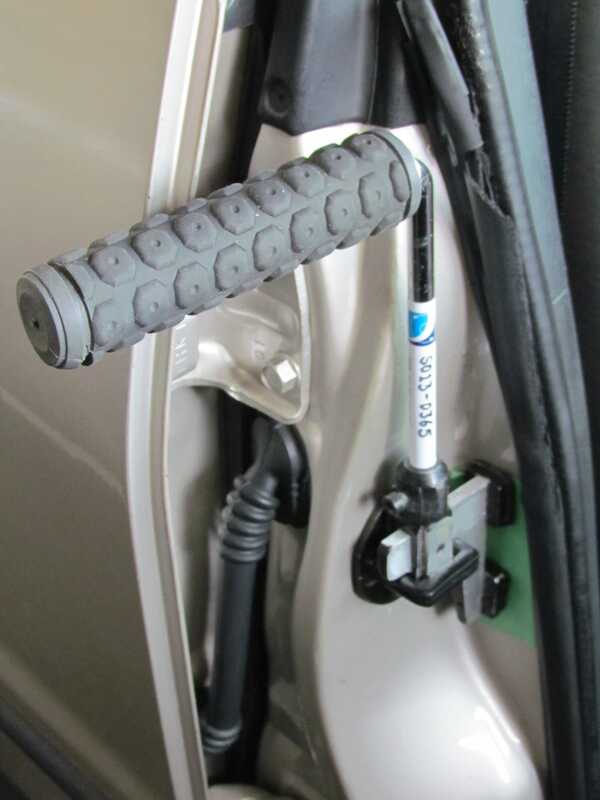 Rubber covered pads fitted closely against the adjacent face of the door pillar provided further stability. Then, together with the engineering skills of TAD Volunteer Mike Atkinson, a simple yet precise design was developed which met all of the project goals. Due to the curved and non-uniform surfaces of the car body at this point, it became necessary to ‘tweak’ the dimensions to achieve a perfect fit. As Mike wisely noted, “It is much easier to trim a little than to cut too much and add it back!” After the collaboration between Andrew, Amanda the Occupational Therapist, and the local volunteers, the handle is now just right. “I use the car regularly to take the children to sporting events. If I can’t use the car, then I’m missing out on the involvement with them and am stuck in the house,” says Andrew. The local volunteers even made sure the handle can be used on either driver’s or passenger’s side of the vehicle and stows easily between the seat and door. “It was so good to work with John, Mike and Amanda my Occupational Therapist. Everyone was prompt, efficient and so helpful to make sure I got the right result for me,” says Andrew.